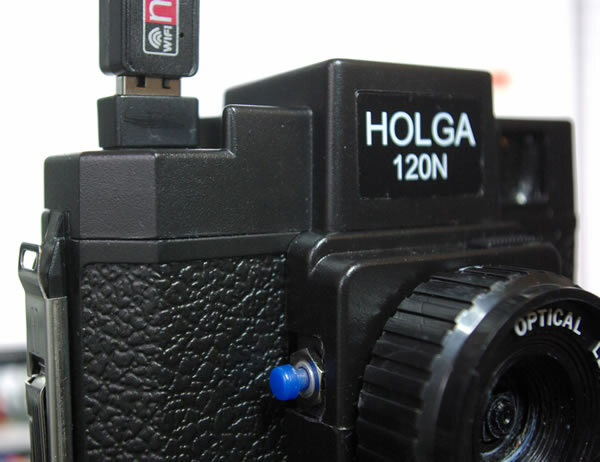 Here’s version 1 of the Holga Raspberry Pi Camera – a hackable, programable camera with a 5 megapixel sensor and HD video capabilities, in retro camera form. And here’s how it turned out.. The Holga is an ultra-cheap medium format camera – if you shop around you can get one for about £15-20 – the model I used for this was the Holga Camera 120N (120 N) (Plastic Lens / Hot Shoe) with the Raspberry Pi Model A – although with a bit of modification it would work with the larger model B. Potentially by soldering the power supply and USB directly to the Pi you could make this a slimmer fit, but I wanted something that didn’t modify the Pi in any way. 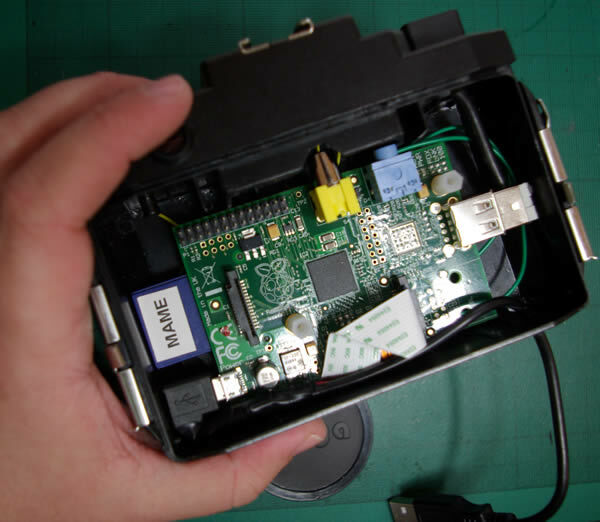 The model A Pi fits quite well – you just have to remote the 2 plastic struts inside the case, and peel off the foam that secures the film reels inside the case. I had to remove the plastic panels that enclosed what would have been the flash (my Holga came without one). I cut up a cheap USB extension cable to mount on the top of the camera – and to plug into the side of the Pi. In order to make it fit with the right angled micro USB on the other side I needed to solder and make my own USB cable (you’ll need the shortest USB plug available – I used a poundland retractable USB cable as the source for mine). If you don’t want to bother with the soldering you could probably just drill holes in either side of the case – there is room, and the plastic is easy to cut through. I also added a couple of plastic struts to locate the Pi in place – it’s a snug fit so doesn’t rattle around inside the case. The yellow wires go to the flash hotshoe – the green to the trigger button on the side of the lens housing, and the red to the power button. Here it’s sitting in it’s case. Snug. The camera module sits inside the lens with the ribbon cable carefully wrapping around the board and over to the socket – I experimented with Sugru to hold the camera board in place (which would work) but wanted it to be removable, so opted to cut up a piece of spare plastic and drill a hole for the module to peek through – it’s a fairly firm push fit which holds it in place. The lens can still be rotated a little to make it easy to level the Pi camera. For the power switch I used the same circuit as for the Motorola Lapdock, and added it to the lens mount. I’ve also added a press button on the other side to use to take photos – this will be (eventually) wired to the GPIO. 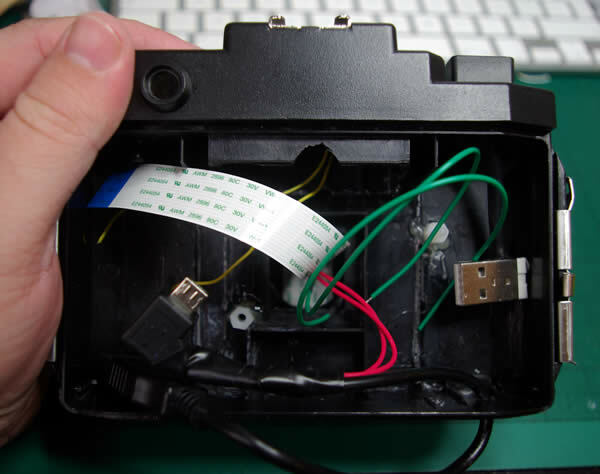 Overall this was a fun project – all the messy cables and glue are neatly hidden (I went a bit overboard on the glue gun when soldering my USB extension cable) and the case was fairly easy to work with. The case also has a nice screw mount for a tripod – handy for securing the Pi with camera to things. 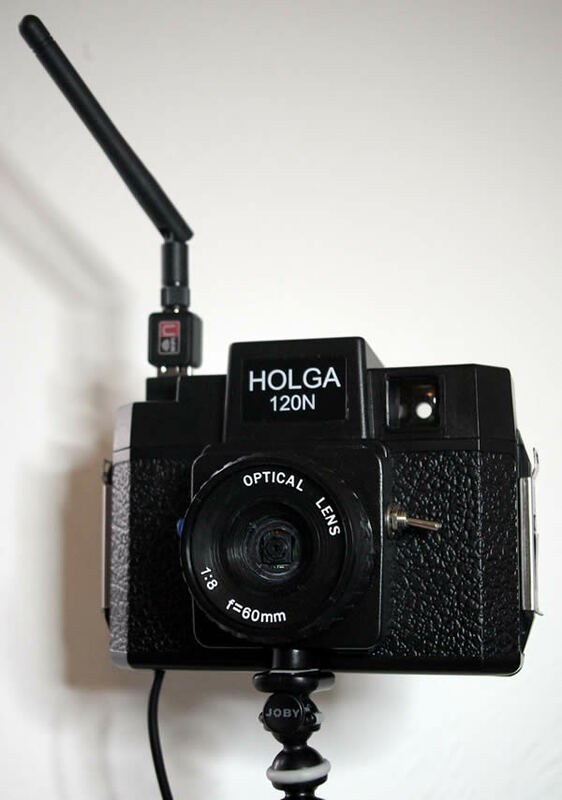 Replicating a simple Camera with the Pi and Holga (HolgaPi? Piga?) would be a bit boring so my aim with this project is to provide a nice case with the possibility of extending it beyond what I could achieve with a normal compact camera. At the moment the GPIO isn’t connected to the shutter button or flash trigger – i’ll do this next and write up the method in another blog post. Write some code to make the GPIO stuff work. I’m relying on this blog post to learn how. Update: check out the following posts in the series. That’s a great project, Pete – I’ll be interested to see what else you manage to do with it! Think of a name – PiSnap or camPi? Write / find some code to make the camera operate over a network. As it lacks a screen the idea of putting all the camera controls into a web app makes sense – TightVLC or similar. OR if everything can be controlled via GPIO, you could try WebIOPi, which is avalable via the pistore, and lets you control the GPIO over the web. Add a speaker and think of some sound effects for the camera to make – just google “Royalty free shutter sound”, there are hundreds. Write some code to make the GPIO stuff work. I’m relying on this blog post to learn how. – Take a look in the MagPi, and ask on the forums, we are all really friendly, I’d offer to help, but i havent got a clue at the moment lol. Spray it red / green to match with the Pi look – Spray? Might be more controld to use moddle paint (good on plastic) and a brush, reduce the risk of messing up the lens or anything. See if I can add a filter mount – Get a cheep skylight filter of the size you want. Most have the thread to attach more fulters after them. The GPIO is really interesting – this is the sort of hacking i’d never attempt with an expensive computer. hi, where are the sample photos?